The RUVO 800a processes both jambs and mullions for exterior doors. 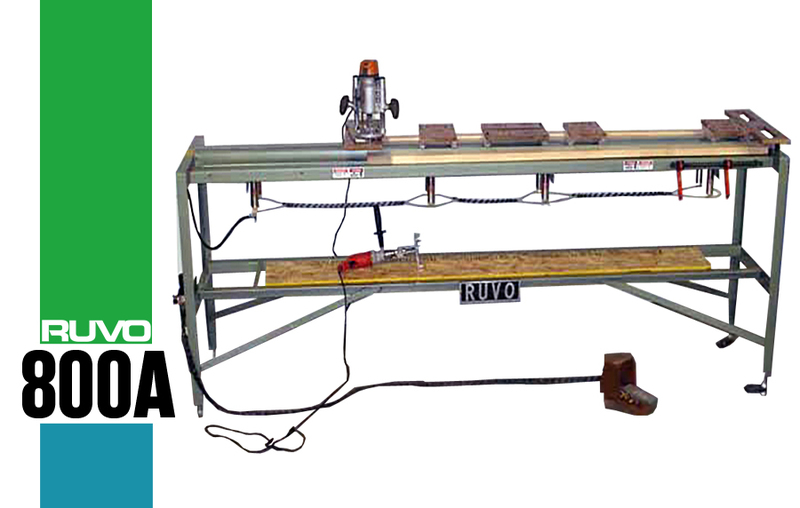 The RUVO 800A Hinge and Strike Jamb Mortising Machine is to be used in conjuction with the machining and preparation for steel door assembly, or whenever a special machine is required for processing jambs only. The 800A will mortise for two, three, or four hinges and will cut for the strike hole and rectangular faceplate. It will cut the head rabbet as well as the custom sill angle cut. The operator places the jambs into the machine and pushes down on a foot pedal to clamp. Then the operator will use the router to route out the head rabbet, hinge mortise, sill cut, and strike and dead bolt mortise. A special fixture drill will be used to bore strike and dead bolt. This machine can be customized to your spcifications, for hinge, strike, sill and head cuts. The RUVO 800A is simple to setup and operate as well as affordable. Get more information about financing to find the solution for you. See how RUVO machines work together for the highest and most efficient production.